Two top Obama economic advisors write in an internal memo that DOL should tighten broker rules; they share some details from the long-awaited fiduciary redraft. A memo from two White House staffers argues that 'brokers' are costing retirement plan participants billions. The White House believes that many retirement plan participants aren’t adequately protected from advisors with conflicts of interest. That’s why President Barack Obama’s chief economic advisor supports the Department of Labor’s effort to amend the definition of fiduciary in retirement plans. 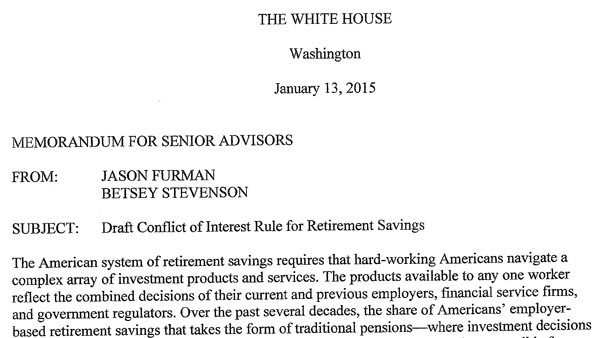 In a Jan. 13 internal memo to senior White House advisors that was obtained by ThinkAdvisor, Jason Furman, chairman of Obama’s Council of Economic Advisers, states that the redraft “represents a middle ground,” and that he agrees with DOL that the current regulatory environment allows brokers to give “conflicted” advice, which costs retirement savers more than $6 billion a year. Furman and Betsey Stevenson, another council member, provide what they describe as “evidence” that proves DOL’s draft “Conflict of Interest Rule for Retirement Savings,” which seeks to broaden the definition of who is a fiduciary under the Employee Retirement Income Security Act, is sorely needed. ThinkAdvisor reported last July that the White House’s National Economic Council would be performing “industry outreach” regarding the DOL’s fiduciary redraft. The NEC was part of a White House working group charged with overseeing the DOL fiduciary redraft. The measure doesn’t ban commissions, as some other countries have done. The DOL redraft “offers consumers meaningful protections, especially by also newly facilitating enhanced enforcement over violators, thereby holding them accountable,” the two economic advisors say. However, Andy Blocker, executive vice president of policy and advocacy at the Securities Industry and Financial Markets Association, told ThinkAdvisor Friday that the memo “fails to address the potential impact” of DOL’s redraft “on everyday investors, which has been our concern all along.” The memo “doesn’t mention anything regarding the impact of a rule change on how people get their financial help,” he said, adding that 80% of people choose to put their money in a brokerage account. The Financial Services Institute, a staunch opponent of DOL’s fiduciary rulemaking, declined to comment on the memo. The two White House advisors state that academic research supports DOL’s argument that the current consumer protections for investment advice in the retail and small plan markets are “inadequate” and that the current regulatory environment under ERISA “creates perverse incentives” that cost retirement savers billions of dollars. Conflicted advice results in losses of roughly $6 billion to $8 billion per year (35 to 50 basis points) for IRA investors, the memo states. An investor receiving conflicted advice who expects to retire in 30 years loses at least 5% to 10% of his or her potential retirement savings due to conflicts, the memo states, or approximately one to three years’ worth of withdrawals during retirement. Of course, the DOL redraft, which is said to reach the Office of Management and Budget any day now, still must go through a 90-day review by OMB. DOL will seek public comment on the measure and has said it will conduct a hearing on it. Senate Majority Leader Orrin Hatch, R-Utah, has already vowed to torpedo DOL’s fiduciary efforts for IRAs via his Secure Annuities for Employee (SAFE) Retirement Act, which he said Congress will take up this year. But DOL fiduciary rule advocates maintain that challenges to kill DOL’s fiduciary redraft in Congress will not survive a presidential veto. – Janet Levaux contributed reporting. — Check out Time for Broker Crackdown as Abuses Cost Retirement Savers Billions: Obama Aide on ThinkAdvisor.